The Inwood Library is slated to get torn down and rebuilt with 100 percent affordable housing, officials said. 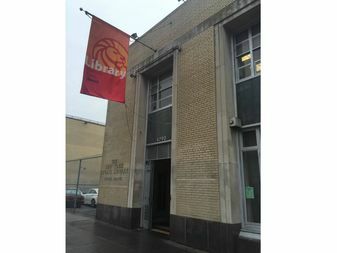 INWOOD — The city plans to demolish the Inwood library and sell the property to a developer to build a new tower with 100 percent affordable housing and a “state-of-the-art” new library, officials announced this week. Construction on the Inwood Library site, at 4790 Broadway, is slated to begin as early as 2019, officials from the city's Housing Preservation and Development told Community Board 12's land use committee meeting Wednesday night. Officials announced that the city is planning to sell the property to a developer who would build an apartment building, the height of which is not yet determined, in collaboration with the New York Public Library, HPD and anti-poverty nonprofit The Robin Hood Foundation. The Robin Hood Foundation would contribute $5 million to ensure that the apartments are 100 percent affordable, officials said. The city would provide a matching $5 million towards the project, they said. Officials said they will prepare a request for proposals in search of an interested developer following a set of two public hearings at the end of the month. “What we’ve been doing at HPD, rather than going out and just developing a site, we actually want to hear from people about what should be at that site,” said Daniel Hernandez, deputy commissioner at the New York City Department of Housing Preservation and Development. The surprise announcement angered many locals at the CB12 meeting who said they're frustrated that the city is moving forward with the plan so quickly, and that most pieces appear to already be in place before the public hearings. “I’m wondering how constrained the whole concept of the workshop is going to be, whether you already have the idea that this is going to be affordable housing... you mentioned that you have a partner and I didn’t hear anything about possible competitive bid or other possible partners," said Michael White, founder of Citizens Defend Libraries. “Robin Hood sounds like a great name, and I’m sure you guys do a lot of good things, but I look at your board and I see Starwood, which was involved in the sell-off of the Donnell Library, I see Goldman [Sachs], which is involved in selling off libraries, and I see Related Companies, which get a lot of favors… I don’t know that I would pick Robin Hood to slice-and-dice my library," White said. "If you’re going to do just two sessions, it sounds like you already have an idea and you just want to do some rubber stamping." The CEO of Starwood is a member of Robin Hood's board of directors, and the CEOs of Goldman Sachs and Related Companies are members of its advisory board, according to the nonprofit's website. He said the city would continue to own the library. “We are committed to two things… one is the redevelopment of the site for a state-of-the-art, modern library and 100 percent affordable housing development for families with low incomes,” he added. The public hearings about the project are scheduled to take place at the library on Wednesday, Jan. 25 from 4 to 8 p.m., and then again on Saturday, Jan. 28 from 10 a.m. to 2 p.m., officials said. Childcare and Spanish translation will be provided, officials said. The current Inwood Library is one of the most heavily used locations in Manhattan and one of the few libraries open seven days a week, with enhanced services, programs and hours, officials said. Although NYPL officials said in a press announcement that the new space “will remain its current size and will maintain existing services, while providing additional space for computers, classes, early literacy programs, and more,” they did not provide information on where the existing services would be offered. White accused the city of going "through the motions" to make it seem like they got input. “Basically, they’re letting the public know ‘we’re selling the library and we want to know what you want after we sell it. It’s not ‘should we sell the library, or preserve plans to enlarge it in the future?” White said. White said the city faced a lot of pushback from the community after it sold a Brooklyn Heights library to developer Hudson Companies for $52 million after critics accused Mayor Bill de Blasio of supporting the deal because of donations his campaign received from the development company. A spokeswoman said the Inwood library is looking into dates to hold additional public workshops, after several residents, including the chair of CB12's land use committee urged the agencies to add at least one more workshop for the public. There will be a survey distributed to the Community Board, New York Public Library and other local organizations regarding the development project, Hernandez added. The library, HPD and Robin Hood Foundation will present to the board's Parks and Cultural Affairs Committee at 7 p.m. on Tuesday, Jan. 10 in the Community Board office at 530 W. 166th St., 6th floor.